Independence Day is just around the corner, meaning millions of Americans will take to their backyards for a stars-and-stripes-themed barbecue. In fact, July Fourth is the number one grilling holiday, reports the Hearth, Patio and Barbecue Association (HPBA). And the most popular food for grilling—no surprise—is burgers. Eighty-five percent of the people polled by HPBA preferred burgers to hot dogs, chicken, and even steak. Booya! There is an art to grilling the perfect burger, of course, starting with the meat you buy. (Extra points if you grind it yourself.) I prefer grass-fed beef with a meat-to-fat ratio of 80/20. 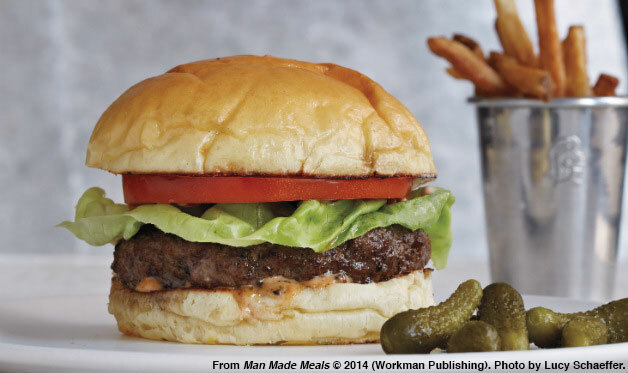 (Beef that is too lean will yield a dry, flavor-deficient burger.) 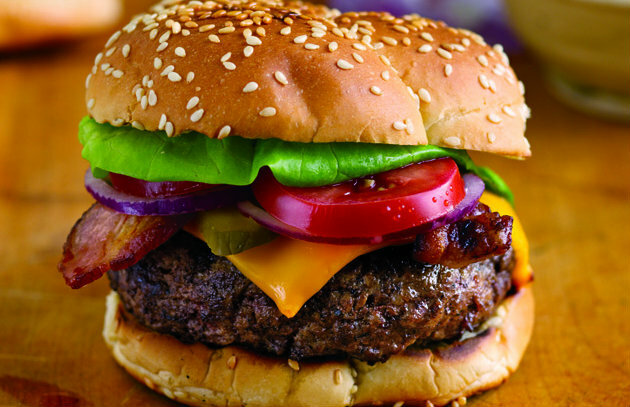 For more tips for making perfect burgers, click here. The Great American Hamburger: A hand-over-your-heart American classic, the kind of burger you crave when you’ve gone too long without one. Hold the truffled mayo and the sunny-side up egg. Step away from the pickled ramps. On the approved list are ketchup, mustard, pickles, American cheese, tomato, lettuce—you get it. Inside-Out Blue Cheese Burger: For food safety reasons, the FDA strongly recommends that ground beef be cooked to an internal temperature of 160 degrees. (Use a good meat thermometer, such as a Maverick, and insert the probe through the side of the burger toward the center.) Unfortunately, the meat can become dry when cooked to medium-well. An antidote to a dry burger is a flavorful stuffing of blue cheese and butter. If you’re not a fan of blue cheese, substitute another cheese, such as grated Gouda, parmesan, or smoked cheddar. 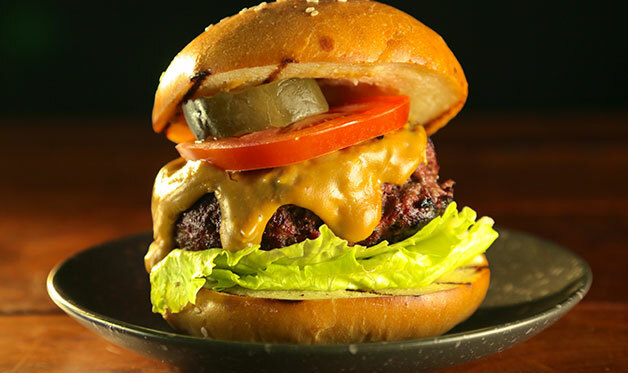 Hay-Smoked Burger with Rauchbier Cheese Sauce: This burger was a hit on the first season of Project Smoke (Season 2 is now airing on American Public Television). Raw beef patties are quickly smoked over hay, grilled, then served on toasted buns with a rich and creamy cheese sauce, the foundation of which is German smoked beer. Add other condiments as desired. 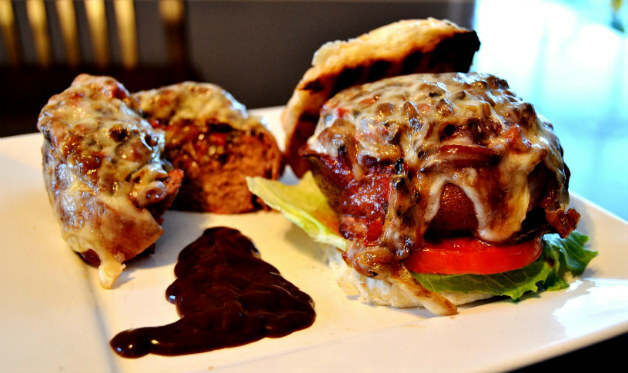 Smoked Beer-Can Burger (plus Variations): Having authored the book Beer-Can Chicken, I was duty-bound to investigate when beer-can burgers—a beer can is pressed into a ball of ground meat and removed before cooking—began making the rounds in barbecue circles. My assistant, Nancy Loseke, developed a master recipe as well as three variations: The Cubano, a version incorporating the elements of Cuba’s favorite sandwich; the French Bistro, like French onion soup in a burger bowl; and the popular Eye-Opener, a recipe I featured on the breakfast episode of Project Smoke. The Ur-Burger: “Ur” is a German word for basic. Similar to the Great American Burger above, the Ur-Burger is finished with a pat of butter. (You could use a compound butter, too, such as my Tabasco Butter. Find the recipe here.) To show the burger off to its best advantage, buy the best bakery buns you can find. Do you have a favorite burger? Please share it with me on Facebook, Twitter, or on the Barbecue Board. In the meantime, have a patriotic and safe Fourth of July.